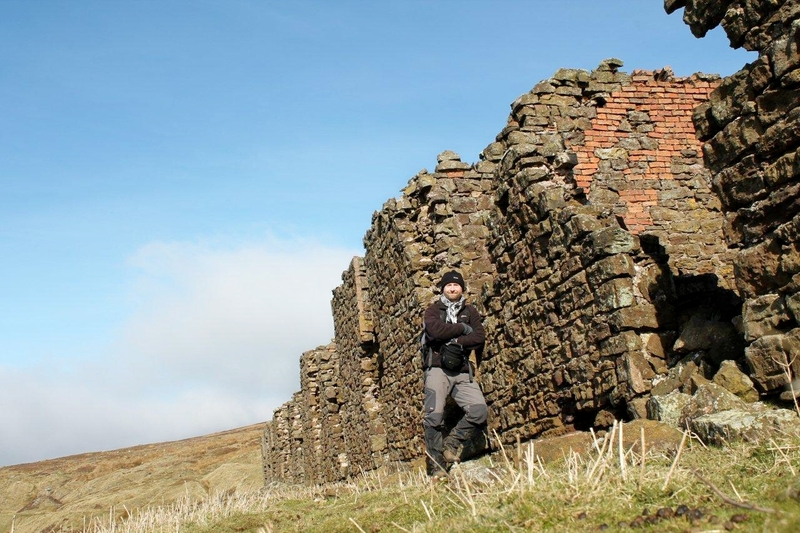 THIS set out to be a hike to the Rosedale iron mines – but I got tangled in a fox hunt and that’s far more entertaining. 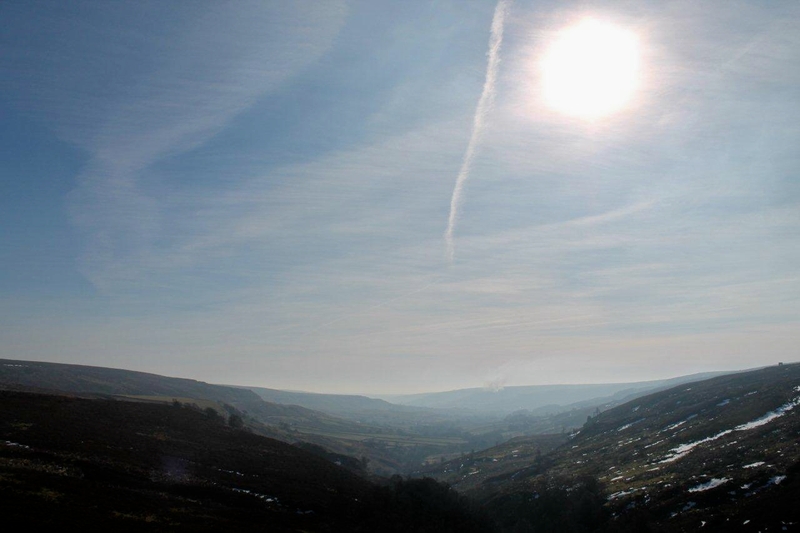 It was also a day of bewildering signposts, dazzling sunlight, heather fire haze and Yorkshire mud. Oh, and there was an immovable dog in a bedroom window. Can’t say fairer than that, really . 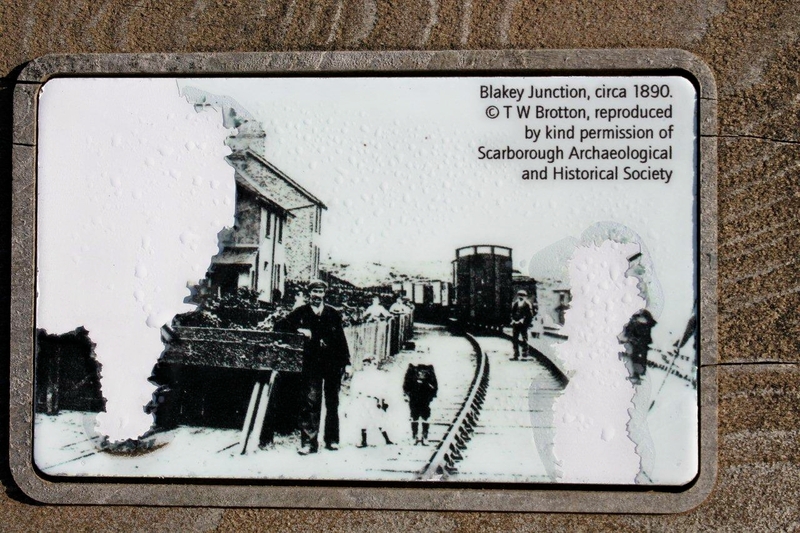 . .
My journey starts at 10pm at Blakey Junction – a redundant railway junction on the crown of the North York Moors. 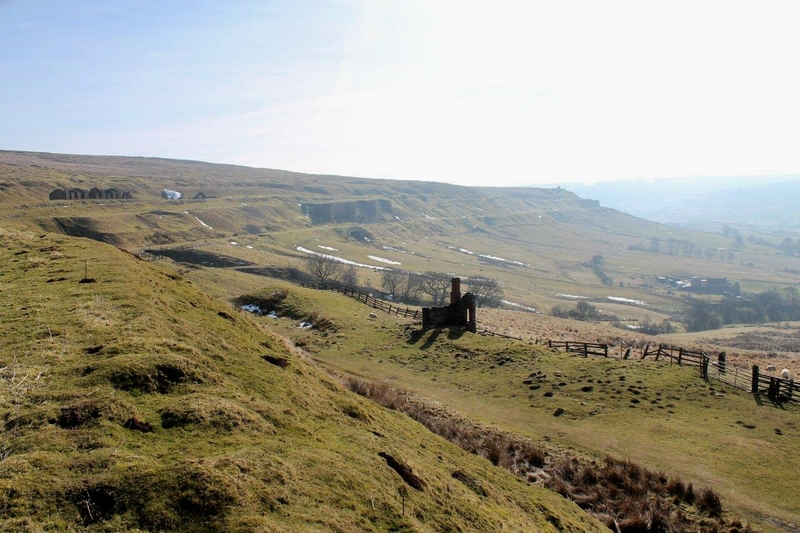 There was a time when steam locos clanked through here from the Rosedale mines, hauling strings of ironstone wagons to Bloworth Crossing and the incline that swoops down the moor to Battersby Junction. 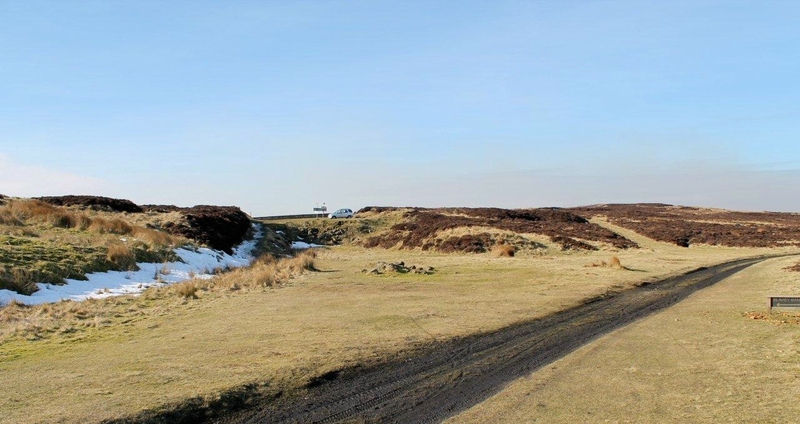 But the last train left about 1929 and the rails were removed, leaving a tangle of cinder trackbeds that crisscross the moors like ancient pathways. They are ideal for walking and mountain biking. 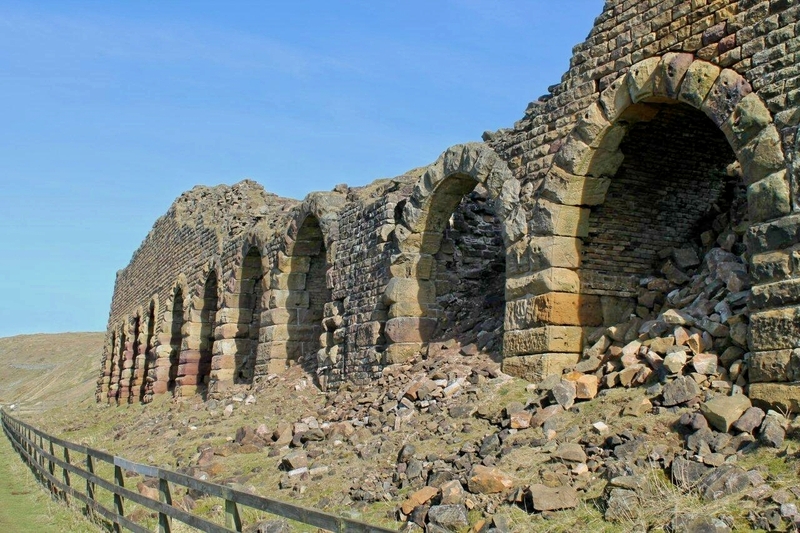 They also lead to impressive ruins that once fuelled the industrial revolution and fed the furnaces of Teesside. Things are a bit quieter these days. I wheeze to a halt, ready to blow off steam over unnecessary and obtrusive advertising in a national park. 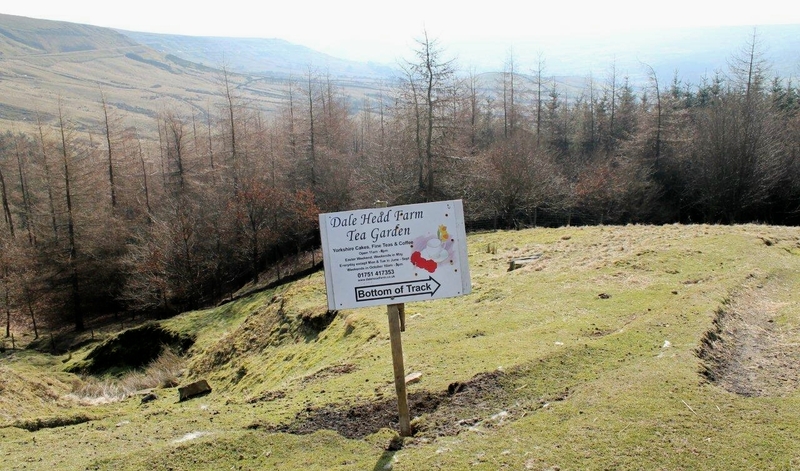 But it crosses my mind that in a recent blog post about farmers diverting footpaths away from their homes I actually argued that, instead, they should invite the public in by opening tearooms. Enough said. Very enterprising of the farmer, if you ask me. I’ve got a few bright coins in my pocket, so if I’m passing Dale Head Farm later I’ll exchange them for some Yorkshire cakes and a pot of Russian Caravan. 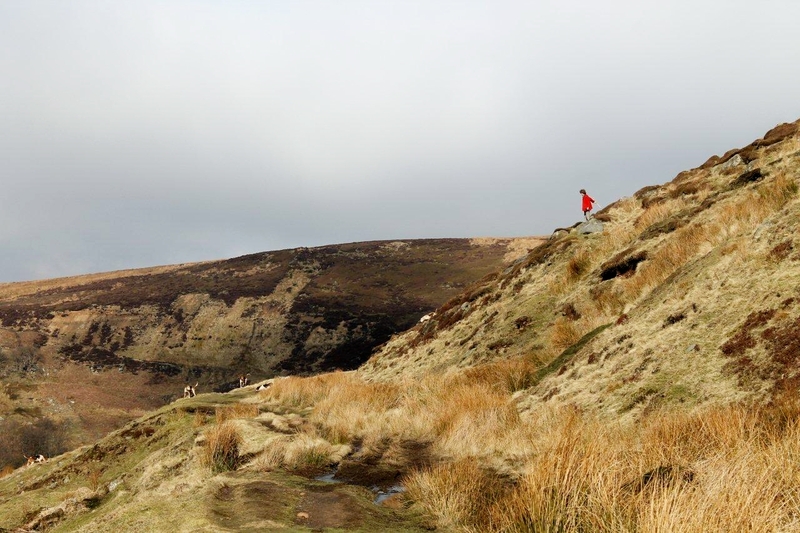 Steaming on, I cross the railway embankment at the head of Rosedale, and I’m clattering down the eastern slopes – not quite as fast as the Old 97 – when I’m suddenly surrounded by foxhounds. I like foxhounds because they are friendly, industrious animals and they flop around expecting you to romp with them and trot after a scent. Perhaps, if I’d been wearing a furry red onesie with a tail stitched to its bottom they might not be quite so affable. But I like them anyway. What I don’t like is the humans who accompany them. If they want to kill something that is allegedly threatening their livelihoods, why don’t they be sporting and pick on an adversary that’s going to fight back? The Taliban, for instance? Meanwhile, back in Rosedale . . .
Parp. A horn blares. Parp, parp. Above me in the heather is a huntsman wearing a red coat with shiny brass buttons. He’s blowing his horn and shouting aggressively at the dogs. I can’t understand a word he’s saying because his voice is so throaty and ill-tempered. It’s pretty apparent that the dogs can’t understand him either because they just carry on doing what they’ve been doing all along. This makes him shout some more. And parp some more. Then he flicks his whip, so I expect this means he is really cross. In his other hand he’s holding a walkie-talkie or possibly a satellite phone. Things have moved on since John Peel’s day. For the benefit of readers not familiar with the English legal system, I should explain here that while it is lawful to hunt foxes with dogs, it is not lawful to kill foxes with dogs. The dogs can be used only to flush the fox from its lair. What happens next is the huntsman types the coordinates into his satellite phone and a Ministry of Defence drone circles overhead and takes out the fox with a smart bomb. It’s called blue on red, apparently. Just kidding. Parp. 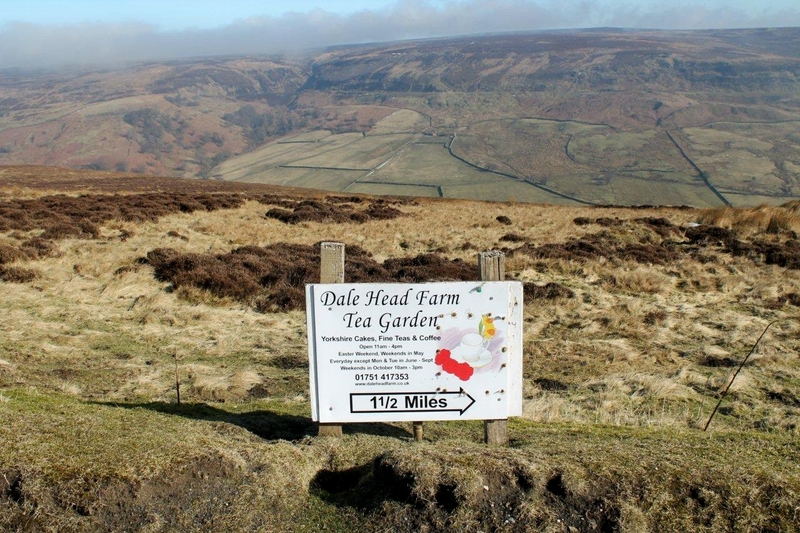 I bid the hounds farewell and continue along the trackbed, stumbling almost immediately upon another sign to the Dale Head Farm Tea Garden. I think this chap’s pushing things a bit. But I admire his or her entrepreneurial enthusiasm. Russian Caravan’s my favourite tea, by the way. After Co-op 99, that is. 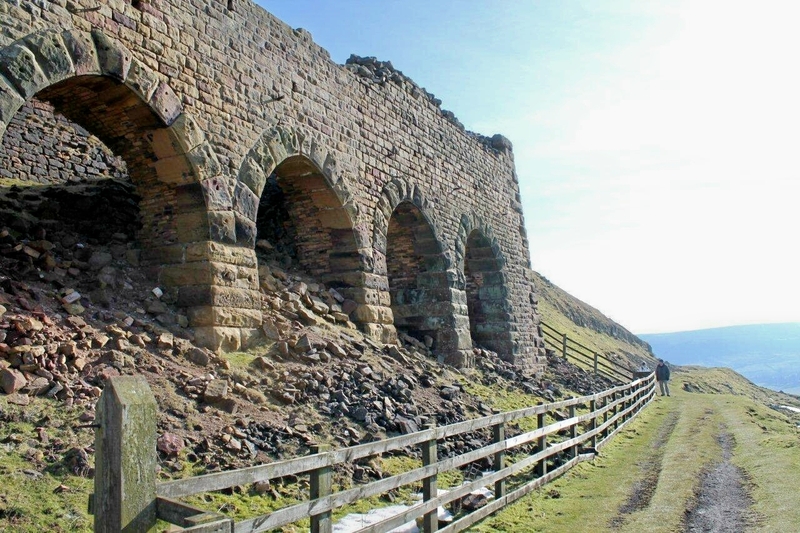 And so, after this series of minor adventures, I arrive at the Rosedale kilns. 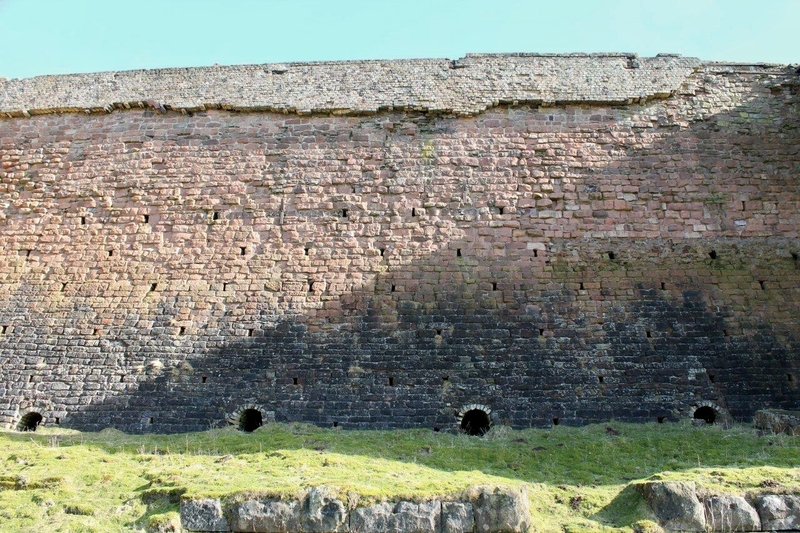 I could go into detail about how these kilns calcined the ironstone to remove impurities before it was shunted away to the blast-furnaces at Middlesbrough. But to be quite honest, Rosedale and its idiosyncrasies have captured my imagination. 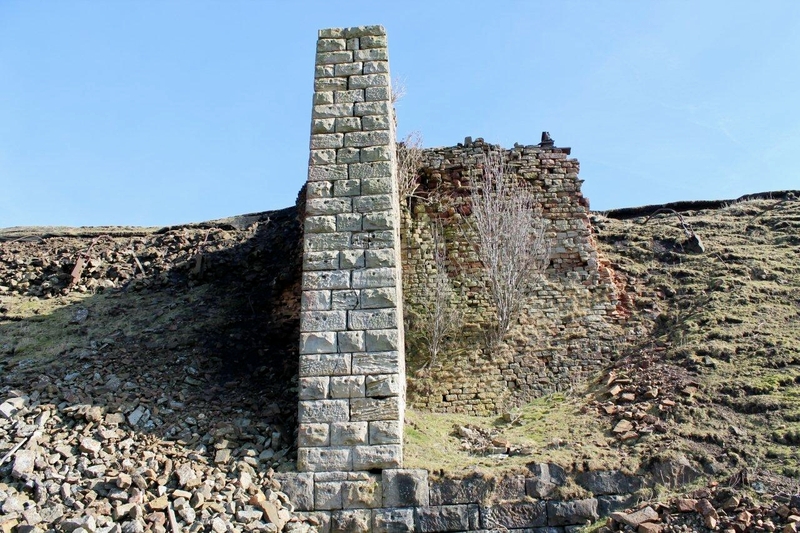 So after exploring the ruined cottage blocks – philanthropically built for the workers in the middle of their workplace to save their legs walking – and the hugely impressive kilns (historical links and references below) I continue into new and exciting country. 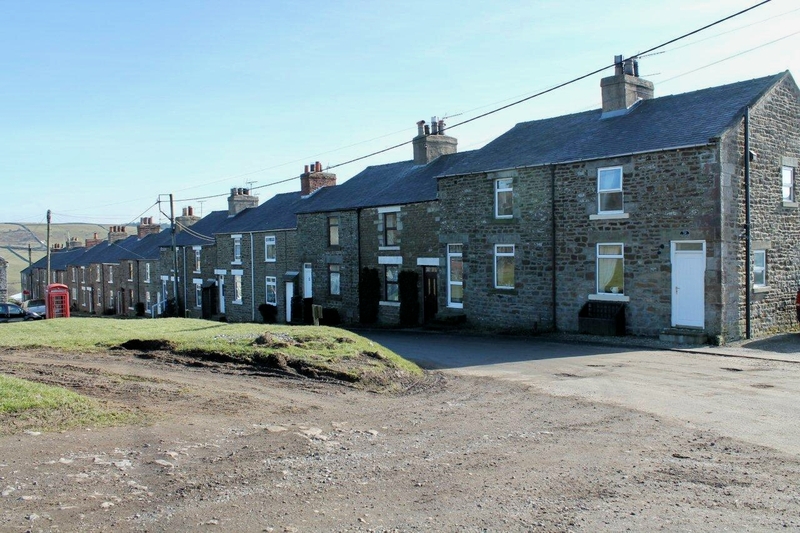 Beneath the railway track terminus lies the charming hamlet of Hill Cottages. I make myself comfortable on a conveniently placed seat that provides splendid views of the houses and pour a cup of tea. It’s at this point I become aware of the motionless dog. In an upstairs window of the second-nearest house is a border collie staring diligently down the road. By the time I’ve finished my tea, and glanced at the dog several times, it hasn’t moved a single muscle. I clap my hands to attract its attention. This doesn’t work. I drink two more cups of tea and empty my flask, then stamp my boots on the gravel, but the dog continues to stare in the opposite direction. Perhaps it’s pining for its master. Perhaps the collie is the Rosedale equivalent of Greyfriars Bobby. My heart goes out to the doggy in the window. The one with the motionless tale. Can you see the doggy in the window? Tea supped, I shoulder my pack and prepare to move on, but not before creeping surreptitiously past the house to gaze in the upstairs window at . . . at . . . a lifesize fluffy toy. Good job no one saw me whistling with my fingers in my mouth. Along the road is a signpost pointing to the River Seven. 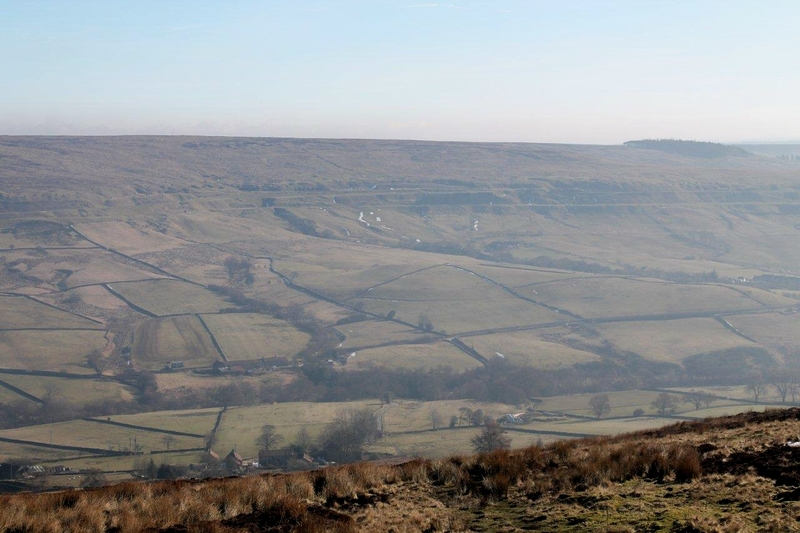 I cross the Seven bridge and ascend the western slopes of Rosedale through three of the muddiest fields in the known world. 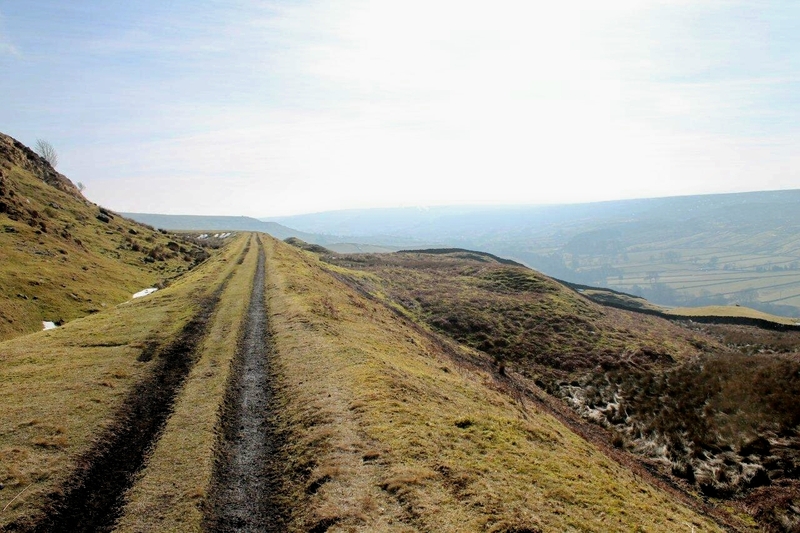 With boots caked in Yorkshire mud, I clamber slowly and painfully back onto the moors and the western branch of the old mineral line, heading back to my starting point. 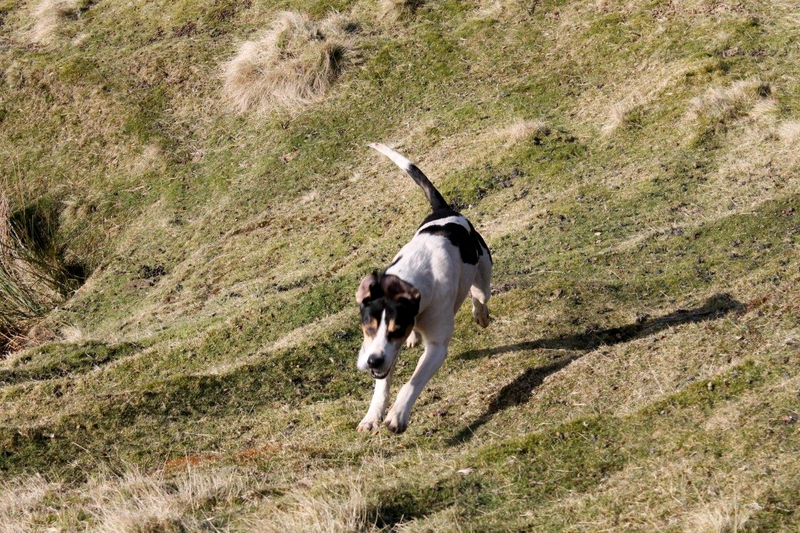 Terrier Men – This unsavoury character will ‘dig out’, shoot or ‘bolt’ the fox when it has gone to ground using terriers. 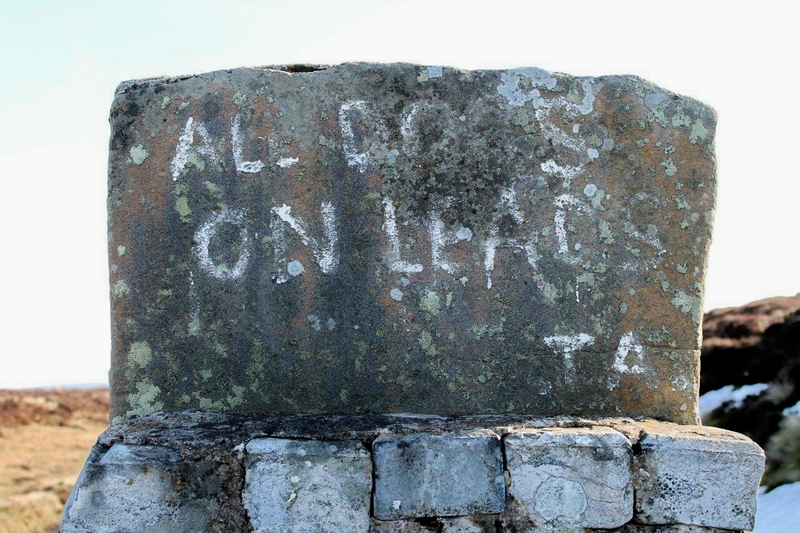 Terrier men are recognisable by their flat caps, Landrovers and leers! Many of them double as pest controllers, and have connections with badger digging. They watch me approach along the trackbed. They don’t take their eyes off me for a single second. As I pass I say: “Ow do.” One says “Ow do” back. The other says nothing. Behind the vehicle are two terriers tied to a stake. They are huddling together for warmth against the wind. I should take a picture of them but I don’t. Down below, the huntsman in the red coat with shiny brass buttons is parping and shouting at his hounds. All are intent on exterminating the wildlife – grown men and a pack of dogs against one unseen fox. Meanwhile, for a bit of perspective, we’re sending boys and girls younger than my son halfway around the world to be shot at and blown up by religious fanatics. We’re sending the wrong people. We should be sending this lot. It would have been so easy for the writer to have omitted that final word, that simple courtesy that transforms a command into a request and – because of its informality – obliges the reader to obey with grace and a good-natured smile. For a fleeting moment, I yearn to have a dog at my heal so I can clip a lead to its collar. It crosses my mind to plod back to Hill Cottages and get that stuffed bugger out of the window. And so ends another day on the North York Moors – another day spent in beautiful countryside that has been shaped by history. Like most areas steeped in natural beauty, it has its uglier, more cruel, more bloodthirsty side. Must come back though. Never did get that pot of Russian Caravan. Danny at Teddy Tour Teas put me onto this geological survey of Rosedale and Eskale. 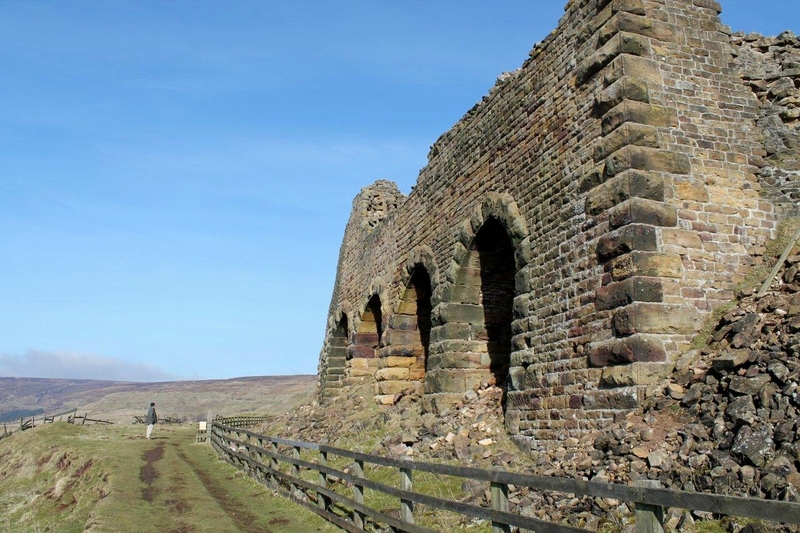 Some interesting stuff from Subterranea Britannica on the mines and railways of Rosedale. 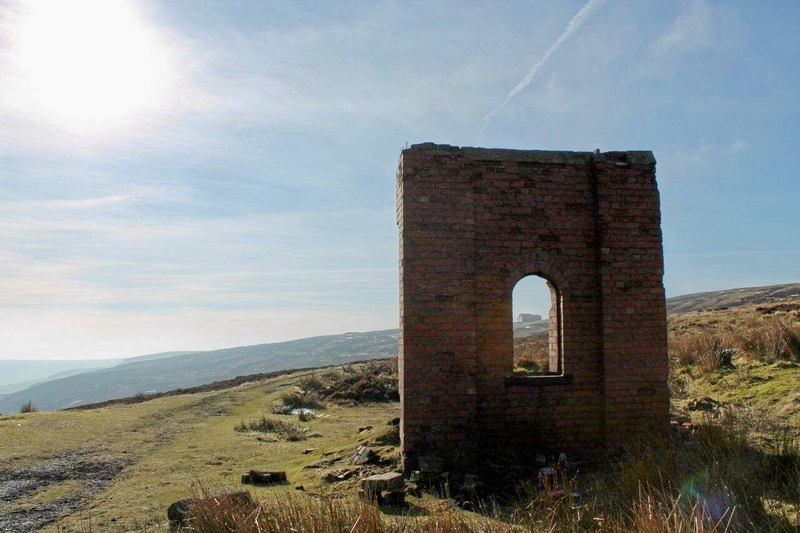 A few notes on Wikipedia on the Rosedale iron mines. Historical notes on the Rosedale railway. 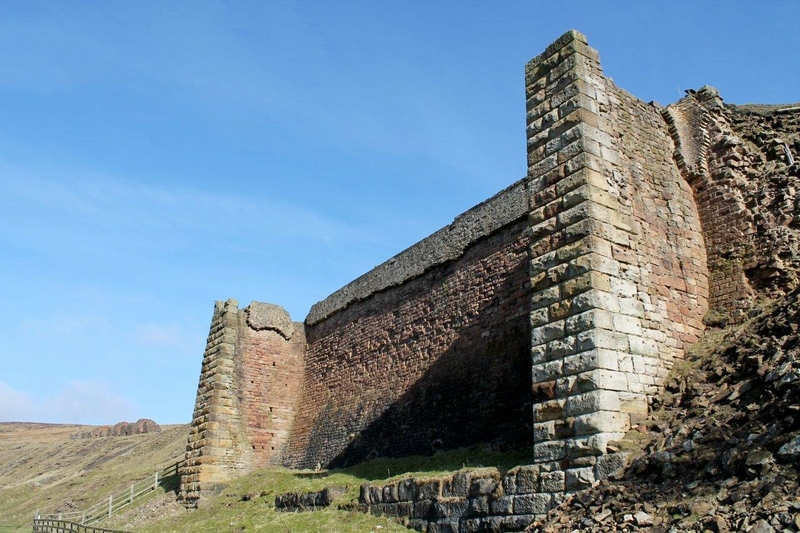 A most interesting inspection of the Rosedale iron mines made in 1857 on the website of the North of England Institute of Mining and Mechanical Engineers. 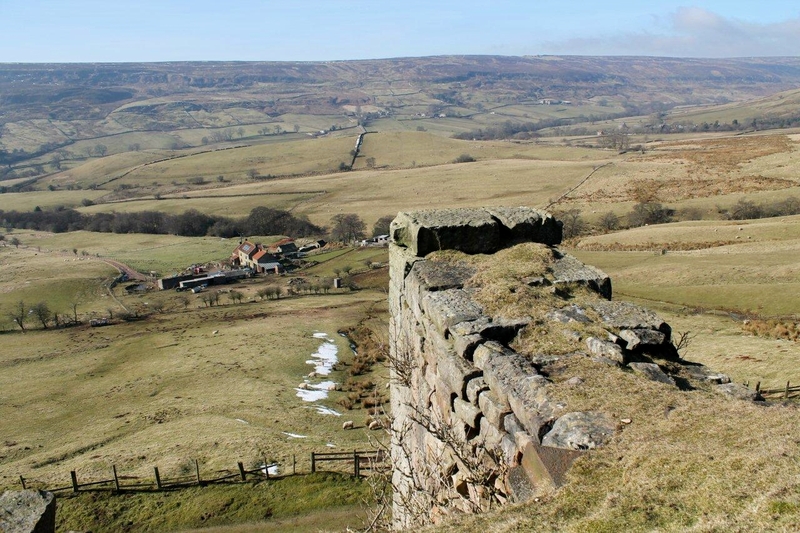 This entry was posted in Archaeology, Climbing, Environment, Footpaths, Hiking, History, Hunting, Industrial archaeology, Mountains, Quarrying, Railways, Walking and tagged Mining History, North York Moors, outdoors, transportation. Bookmark the permalink. 27 Responses to Only a Rosedale, I give you . . . Very entertaining Mr McEff, thank you. Where there’s muck, there’s brass buttons. By eck. It’s that Yorkshire lass. Tha wants nowt poking thi nose in round ere. I have to say I hate fox-hunters with a vengeance – or anyone who thinks it’s a great idea to kill wildlife – the only wildlife we have in our whole area now are birds! 😦 The only good thing is that now I can drive as fast as I like ‘cos I know I’m not going to kill something which dashes out in front of my car. 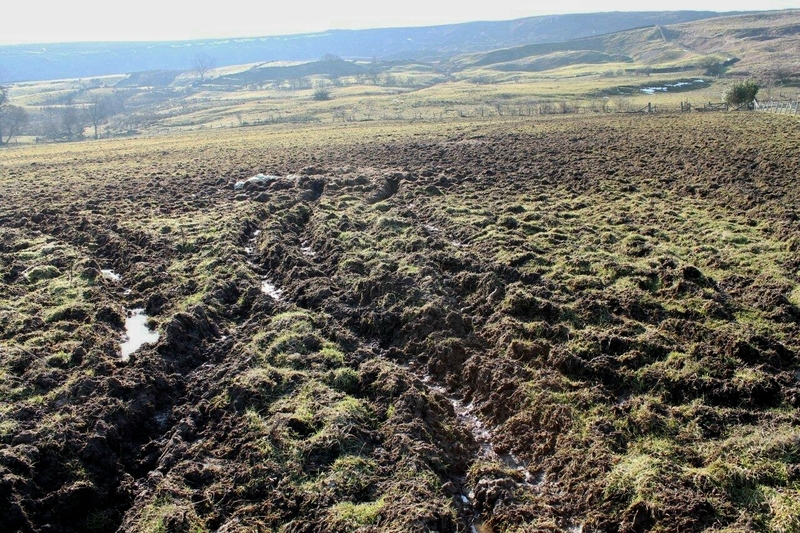 Like you say though, most of the hunters are in expensive 4x4s – farmers generally have a battered old landrover round here – so that says to me, the farmers don’t have that much to do with fox-hunting. I’ve always said it was a class issue rather than a countryside issue and a lot of farmers agree with me on that. You’d love my house – it’s stuffed full of fluffy (but very lifelike): bunnies, dogs, a sleeping cat, seals, reindeer a cheetah and a hedgehog! 😉 Once I bought a few myself, others got the idea and kept buying me more! Carol, I agree with you wholeheartedly on the class issue. A couple of days after I went to Rosedale I was out running near my house and got tangled up in yet another hunt – which was either the Zetland or the Hurworth (almost sure it was the former). Horseboxes, cars, 4x4s all parked up on the roadside verges in places walkers would never consider leaving their cars. The pillocks blocked the road with their vehicles when the hunt moved off and followed it at a slow trot as if they owned the sodding transport system. Thankfully, the hunt went one way and I went another, but on my return I noticed that the verges where they had parked were all chewed up and there were crisp packets and plastic bags left for someone else to remove. Guardians of the countryside, my backside. Riding with the hounds is a pastime for people with money and time on their hands who don’t give a stuffed otter about the wider threats to the environment, and hangers-on who aspire to that circle for the social contact they assume it might bring. On a lighter note, when your house gets too full of fluffy animals you should consider planting some of them in unlikely places. The cheetah would give people a fright peering from under a rock on Great Gable. Me certainly. I’d see it, stand there for half an hour waiting for it to move, then turn around slowly and retreat. The cheetah’s too small to give people a shock – they’d think it was a spotty weasel or something 😉 Now, if I borrowed my mother’s large, stuffed lion – that would give them a shock! I also think another fault of ‘hunters’ is the amount of racket they make to further despoil the peace of a walk! I cant see the doggy in the window!! oh well! Now I can!! hope you are well. Hi John. Fine thanks. Good to hear from you. Disappointment, I was waiting for the cafe report. Greg, I’m so sorry. I’ll make a special trip back there sometime in the near future and do a special report. Another great trip report there. I like you have a fondness for the hounds but not the owners, I could Parp (sorry!) 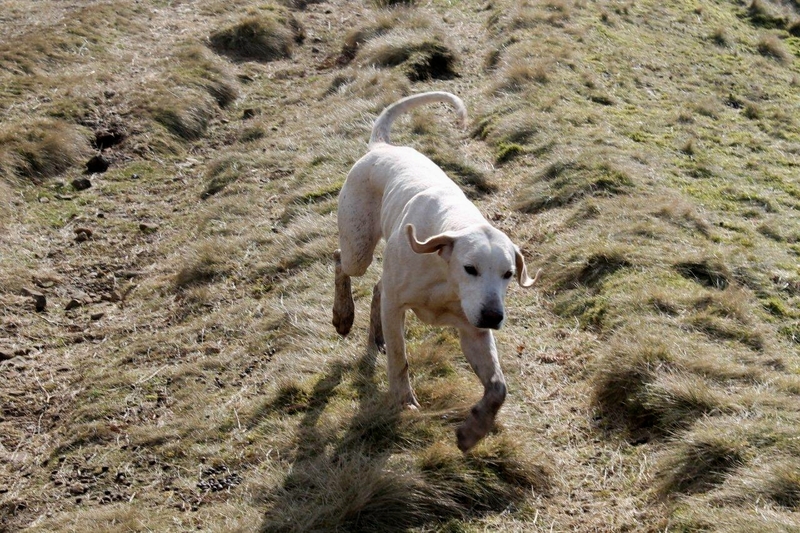 on but I wont…There was a time centuries & centuries ago when a fox ran to ground & that was the end of that, but now as you say, its ‘blue on red’ there’s no sport in that. I like the story from a few years ago when you spied the fox as the hounds went by, who said romance is dead. Hi Paul. Thanks for that. 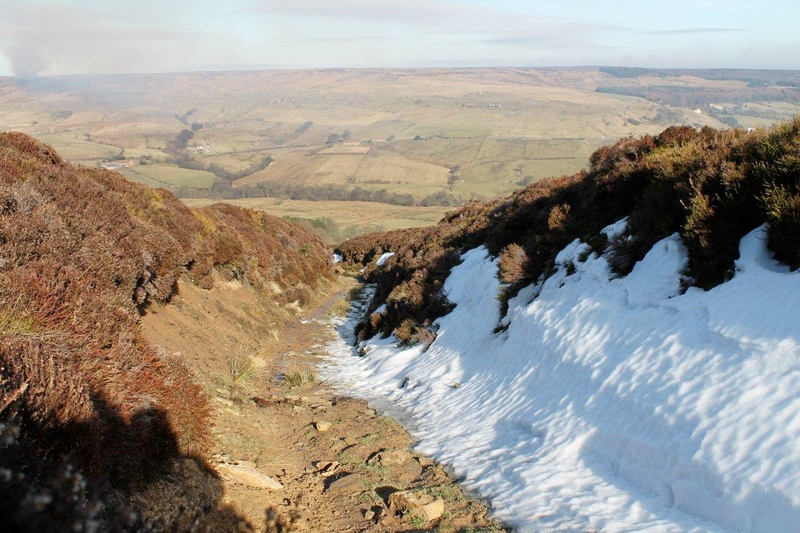 I’m growing quite fond of the North York Moors but I was thinking only today that I must get back over the Lakes. Haven’t been over for a few months. 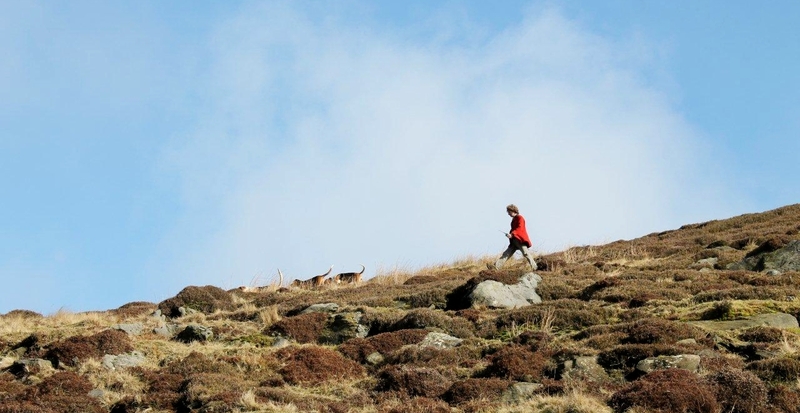 I don’t recall bumping into many hunts on the fells. They’re all over the place on this side of the Pennines. Nearly as many hunts as there are foxes. 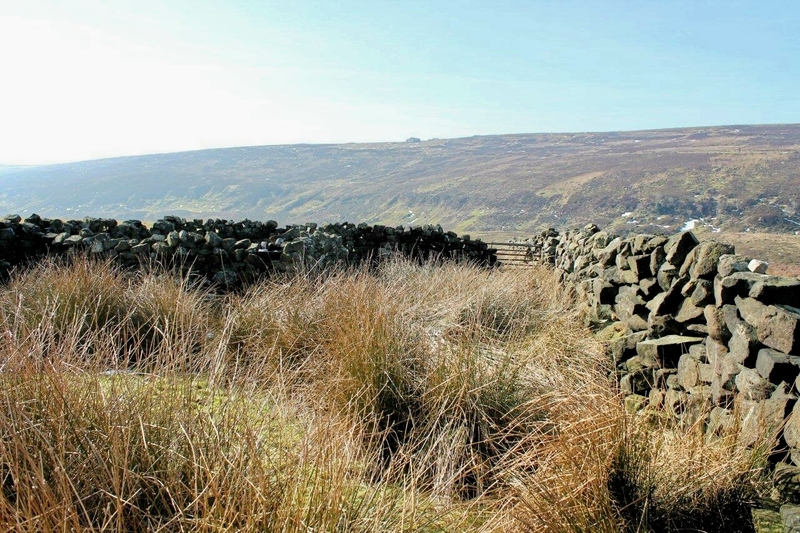 I find the landscape North York Moors incredibly beautiful. It’s nice that the sun is shining on your hike. Your idea about sending the huntsmen to war is very good, except that the military has certain minimum requirements. Speaking of Afghanistan the British Army gave a Christmas present and a Christmas greeting to each of the Danish soldiers knowing that the only thing they got from Denmark was a common greeting from the Danish defence. I am quite grateful that the British Army thought of our Danish soldiers in their horrible job. Hej Hanna. Yes, the sun does shine here occasionally. And when it does we all rush out in our shorts and sunglasses. The sun’s shining again today, but unfortunately I’ve got to go to work later. 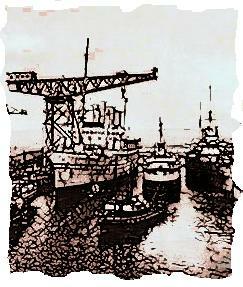 I’ve not come across the Find Permit A 38 story before but I’ve just been reading about it on the internet. Very Kafkaesque, and very timely because I’m reading Kafka’s The Man Who Disappeared at the moment. I shall have to get hold of the Twelve Tasks of Asterix. That’s interesting what you say about the Danish troops in Afghanistan, because watching the TV news in this country it is very easy to assume that only British troops are involved. This was brought home to me a couple of years ago while on holiday in Warsaw, when it was quite an eye-opener to see Afghanistan from the Polish perspective and watch Polish troops carrying out their duties. I’ve just had a quick glance at Wikipedia and counted the flags of 51 nations participating in the Isaf force since the conflict began. So let’s send the huntsmen. It looks so beauriful. And yes you must visit this side of the country sometime. we have wonderful sceneryand even snow this week. Hello AnneB. Yes, one of these days I shall bite the bullet and head for the Welsh hills.Haven’t been there since we had an altercation with a butcher in Bangor. That was so long ago I can’t even remember which decade it was in. Hi Alen, I loved this write up and I’d love to take a ramble out that way meself sometime. I am now gonna try to work out your route. Any chance of a map? Blimey, Tracey. The things I have to do . . . 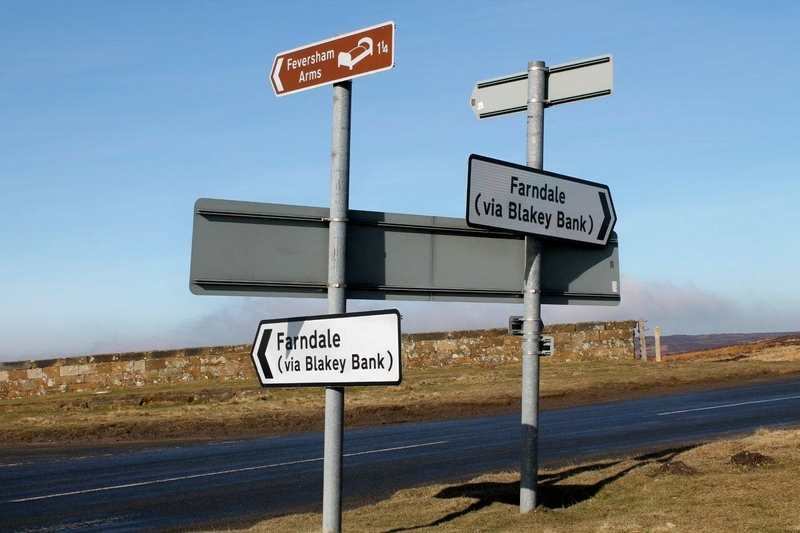 I parked at Blakey Junction because I drove via Stokesley and Westerdale, coming down from the north. It’s probably the quickest way from Richmond too. 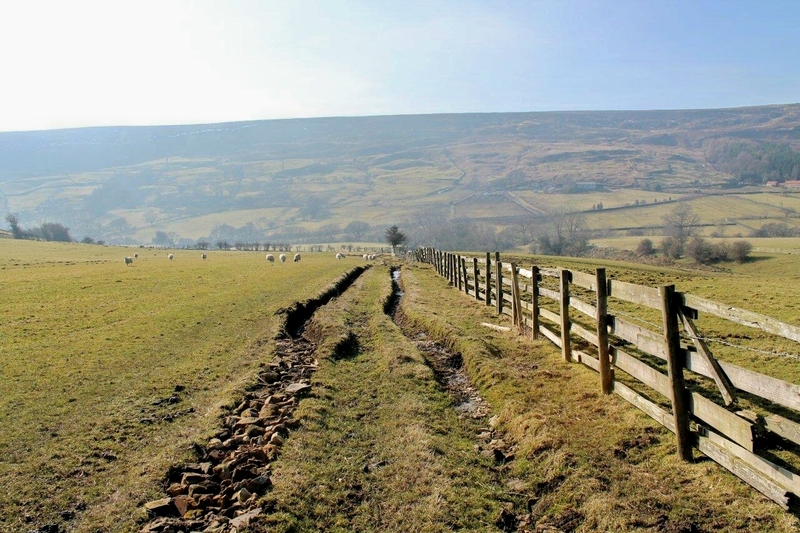 The trackbed is quite muddy in places (especially at the head of the valley), as are the fields on the western side of the Seven. But it’s all open access or public rights of way and everything is straightforward. The daffodils are coming out now, so things should be even more pleasant. Ha ha. I missed that one. What a great story. I loved the cricketers carrying on playing because they felt safe on the cricket field – very British. And the tiger blowing over in the downdraught from the helicopter rotors. I bet they had a good laugh over that. I don’t know if you’ve been over Kirkby Stephen way lately, David, but there’s a tree on the top of Ashfell before you drop down to Ravenstonedale that appears to have loads of shoes tied to the branches. I’ve glimpsed it a couple of times and one of these days I’ll stop to take a picture. Thanks for the info. I will keep an eye out when I am over that way. It could make a good pic. Hi David. Thanks for that marvellous comment. I shall drop in again sometime if you don’t mind. Hi Tracey. Hope you had a good day. That poor dog . . . sitting there all that time. We should take a bone for it.